SOME of the evidence given by Rabbi Zvi Hirsch Telsner was not accepted, his “recollection is inaccurate”, his comments were “likely to have the effect of dissuading some members of the Yeshivah Melbourne community from communicating with the secular authorities about child sexual abuse” and he failed to “provide pastoral leadership, support, direction and affirmation for abuse survivors, their families and advocates”. Those are some of the findings published in the Royal Commission into Institutional Responses to Child Sexual Abuse’s report that was tabled in Parliament this week. According to the report, Rabbi Telsner gave two defining sermons in 2011. The rabbi admitted to the Royal Commission that he knew the first sermon, in June, was seen by many as an attack on victim AVB, who asked people to help police investigate child sexual abuse allega-tions, but the rabbi did not make any attempt to correct that perception. “The timing of the sermon and the understanding that it was directed at AVB was likely to have the effect of dissuading some members of the Yeshivah Melbourne com-munity from communicating with the secular authorities about child sexual abuse,” the report stated. The second sermon, a month later, was seen by many as an attack on another victim, Manny Waks, because Rabbi Telsner asked, “Who gave you permission to talk to anyone?” only a week after Waks pub-licly disclosed his abuse. Rabbi Telsner denied it was about Waks. “We are satisfied that Rabbi Telsner’s recollection is inaccurate,” the report said. On both occasions, Rabbi Telsner accepted that his failure to correct the perception, if not reality, that his sermons were attacks on victims were a failure in his leadership. 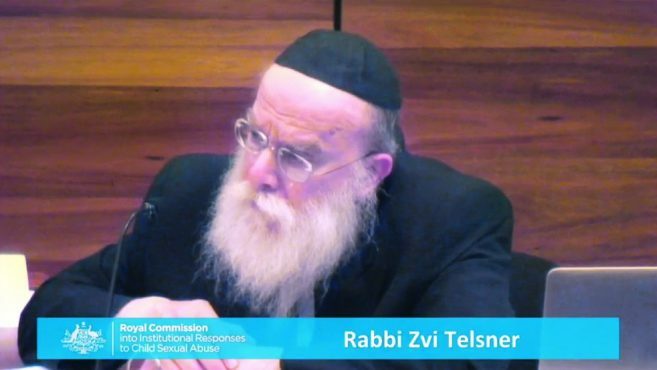 In September last year Rabbi Telsner was forced to stand down from his role as head rabbi at the Yeshivah Centre after a clash with a victim of child sexual abuse. Despite his resignation, he remains a key figure in the Yeshivah Centre and the synagogue. The Royal Commission’s report said it was not only Rabbi Telsner that failed, but also the entire leadership of the Yeshivah Centre. “After public notices advised members of the community to provide information, public statements were made criticising discussion of the topic,” the report said. “The leadership did not create an environment conducive to the communication of information about child sexual abuse. If any-thing, the mixed messages were likely to have produced inaction. The report did note that Yeshivah “has taken significant steps” in regards to child protection over the last few years, and noted that the most recent case of alleged abuse, in 2008, was handled well by Yeshivah and Chabad Youth. The Yeshivah Centre said in a statement that it “deeply regrets its failure to protect those who were victims of child sexual abuse”. “The Yeshivah Centre Board and staff have been working hard to properly respond to these issues and ensure that we embed policies and processes of the highest standards to create a safe environment for our children, and to support and show compassion for victims and their families,” it said. Waks said in a statement from himself and other victims that: “The report highlights the failures of the Yeshivah leadership, and in particular the late Rabbi Yitzchok Dovid Groner [who was the head of Yeshivah when children were abused], which directly resulted in the sexual abuse of numerous children. Waks went on to say that regrettably, in the year-and-a-half which has transpired since the public hearing into Yeshivah, while there have been many positive develop-ments, the response of the centre has fallen well short of what ought reasonably to have occurred. In Sydney, former Yeshiva leader Rabbi Yossi Feldman has been slammed because “when considering the issue of child sexual abuse, Rabbi Yosef Feldman’s focus is on the perspective of the perpetrator rather than that of the victim” according to a report. The report also said that he was either “ignorant of or ill-informed about: conduct amounting to child sexual abuse; the criminal nature of child sexual abuse; the obligations in New South Wales to report complaints of child sexual abuse to external authorities, including the NSW Ombudsman”. It also said that when Rabbi Feldman responded to a series of leaked emails in 2011, which included him stating that victims should con-tact a rabbi before speaking to police, he prioritised publicity over truth. Rabbi Feldman said the Royal Commission is wrong. “They didn’t understand a lot of stuff,” Rabbi Feldman told The AJN. “Just because I discussed the per-petrator, doesn’t mean I don’t care about the victim and there is no evid-ence that I don’t care about victims. “It looks like they have an agenda because they just want to put down religious people – especially the churches – and they found me as a sacrifice. Gavriella Aber, who wrote Yeshiva’s child protection policy, said the school is “committed to the highest standards of child protection in our policies, protocols and their delivery”.